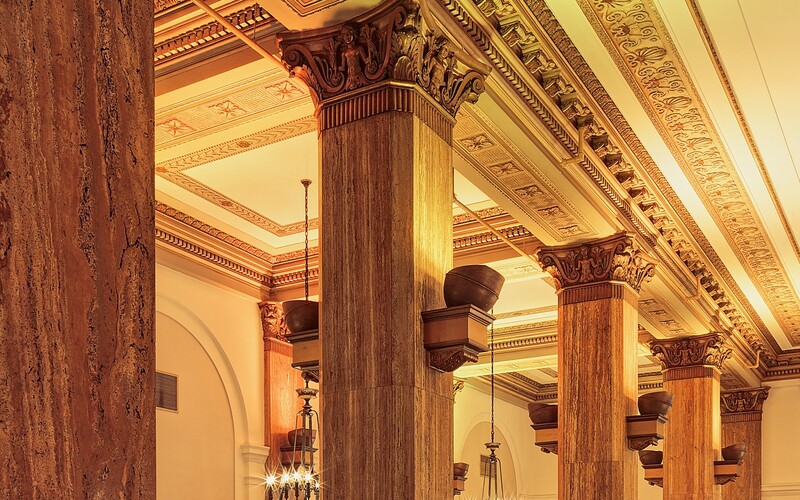 Designers American Energy Care (AEC) used Lumentalk technology to modernize the lighting system in a 112-year old building. Lumentalk enabled digital control over the existing AC power lines, making it unnecessary to install new cables for data. AEC then replaced metal halide lamps with Lumenbeam Grande Color Changing luminaires, giving the space the flexibility to change as needed. 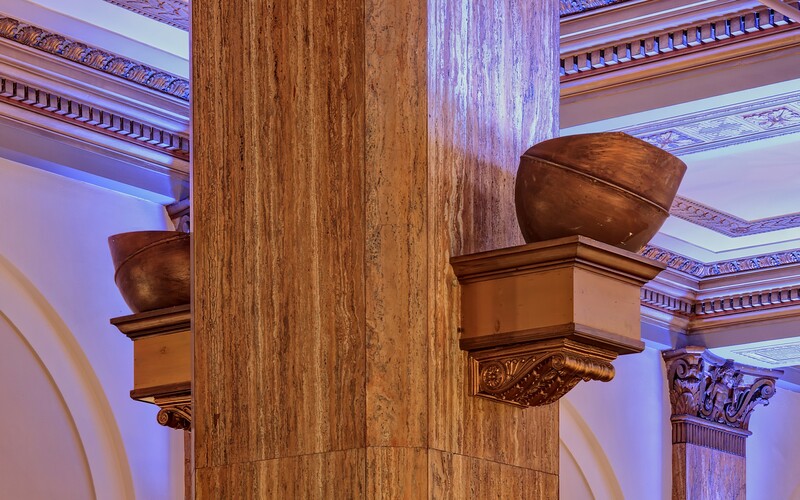 The luminaires were installed inside sconces attached to large ornate columns. 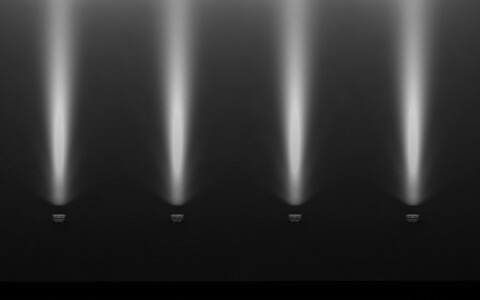 Aimed towards the ceiling, the luminaires dramatically improve light levels in the facility. 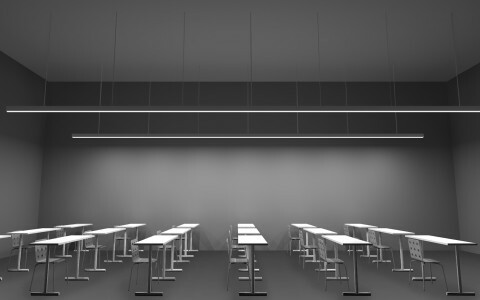 The end result reveals the space’s original grandeur, reduces costs and boosts flexibility – creating a banquet hall that is timeless and modern. 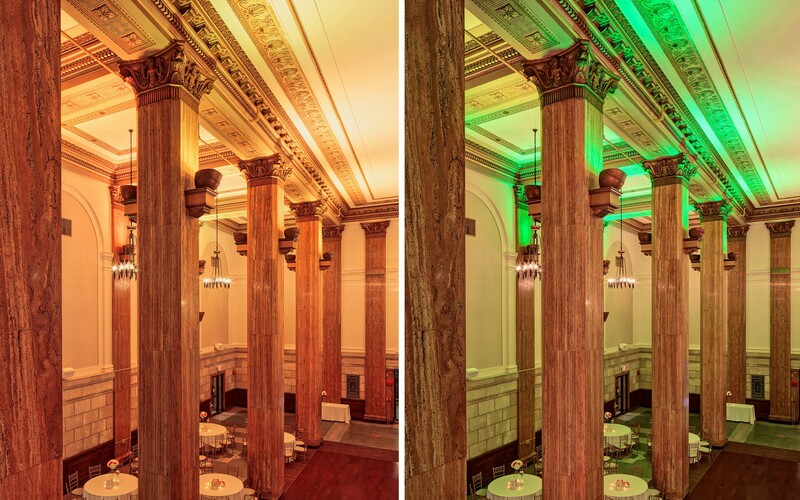 With no scope for new wiring, American Energy Care used Lumentalk to bring digital control to the grand lobby of an historic building in Albany. The LED lighting design has cut operating costs and transformed the space into a multi-functional banquet hall for the 21st century. Lumentalk was absolutely critical. 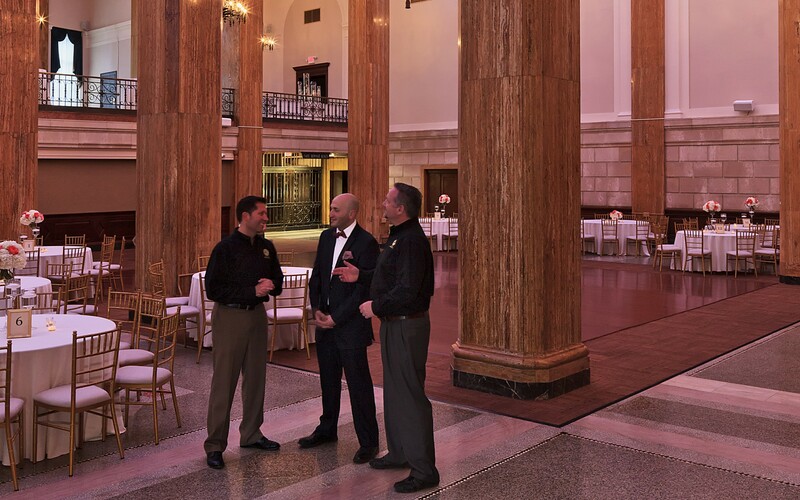 Because of the historic nature of the space we faced numerous wiring limitations and structural issues, and it made the conversion process simpler and much more cost effective. How do you turn the lobby of a 112-year old building into a modern, multi-functional banquet hall? This was the question posed by catering company Mazzone Hospitality, which sought to transform a 14,000 square foot space in Albany's National Savings Bank building (now the State Street Executive Suites). Hoping to meld the character of original architectural features with 21st century functionality, the company turned to designers American Energy Care (AEC). "Mazzone Hospitality needed to cut both the high cost of operation (power) and the cost of maintenance, and dramatically improve the flexibility and "look" of the space. The first thing we suggested was a modernization of the lighting system, followed by other energy and control improvements," said Jamie Thompson, President and CEO of AEC. "The challenge, though, was to deliver high-quality, controllable lighting, while still keeping the installation with a good payback and the future energy costs low in such a complex and large space," said Eric Marsh, Director of Energy Engineering at AEC. 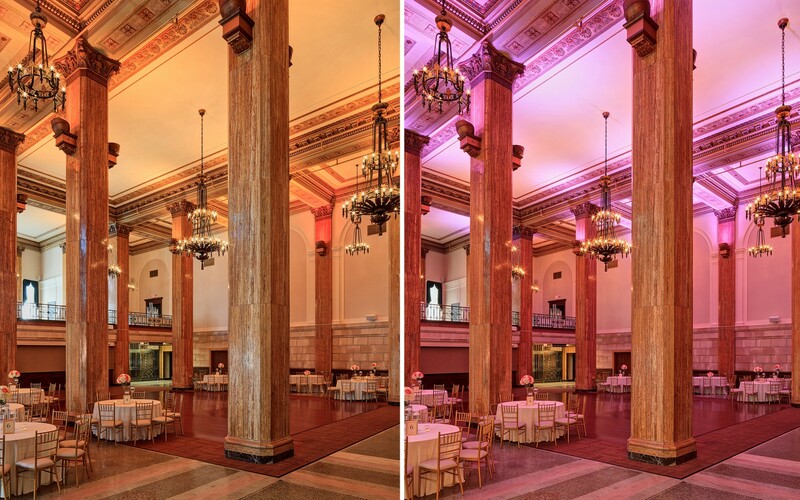 To achieve this, the firm used Lumentalk technology to bring DMX control over existing electrical wiring. 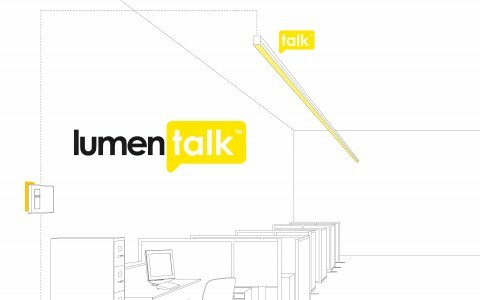 Lumentalk enables digital control of LED lighting over AC power lines, making it unnecessary to install new cables for data. In this way, AEC was able to convert the banquet hall to flexible digital control and LED lighting, avoiding the cost and disruption of having to rewire the space. "Lumentalk was absolutely critical. Because of the historic nature of the space we faced numerous wiring limitations and structural issues, and it made the conversion process simpler and much more cost effective," Thompson said. AEC was then able to replace the original 1000W HID metal halide lamps with 100W Lumentalk-enabled Lumenbeam Grande Color Changing luminaires. 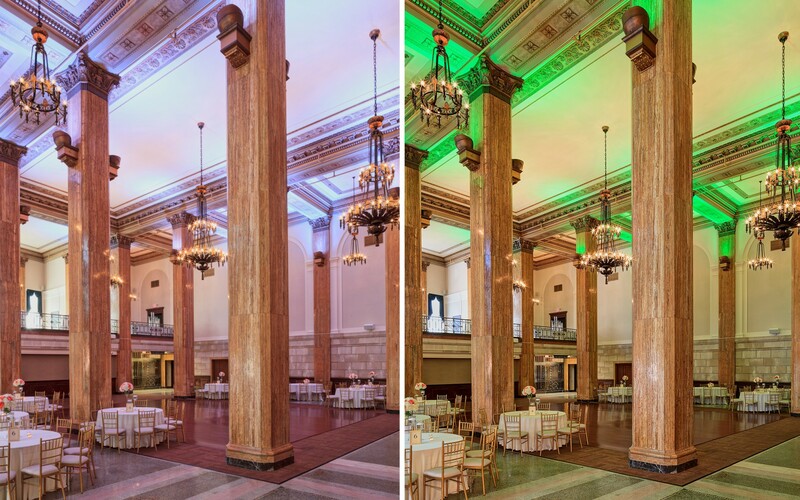 This switch has slashed total power consumption by over 40,000 watts, and given the hall the ability to change the color of the room for different events. 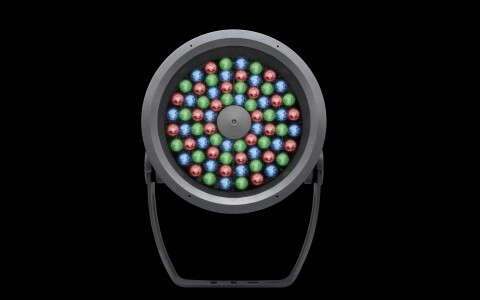 "The Lumenpulse fixtures were used to provide both white lighting and controllable colored lighting. It's a terrific benefit to the hall, giving Mazzone the flexibility to accommodate a much larger array of events, be it social, charitable or even political," Thompson said. 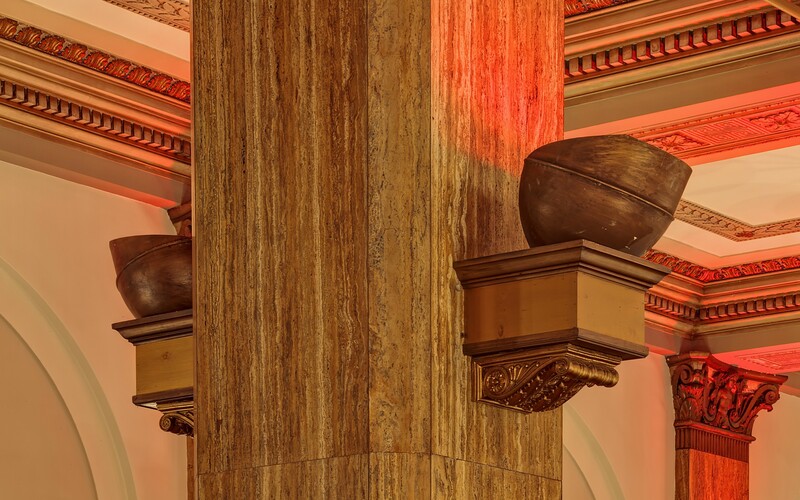 Installed inside sconces attached to large ornate columns, the luminaires were aimed towards the ceiling, dramatically improving lighting levels in the facility, and revealing architectural elements on the 50-foot high ceilings. The end result has heightened the space's unique, and original, grandeur, while still boosting its flexibility - creating a banquet hall that is both timeless and modern. "AEC delivered a system that exceeded our expectations for this space. It's lowered the monthly utility bills, and given us the ability to provide a unique look and feel for every presentation and event," said Matthew Mazzone of Mazzone Hospitality. "Plus, it just looks fantastic."